Since rotating into view, the sunspot group AR12192 has continued to grow in size and complexity, becoming the largest sunspot of the current solar cycle, cycle 24 (SC24.) The region has produced numerous C and M-class flares including an X1 flare. Watts Up With That Has more details including an animation of sunspot AR2192 HERE. So far we have escaped a two potential EMP threats, but the danger continues to grow. Earth-effects could increase in the days ahead. AR2192 has an unstable ‘beta-gamma-delta’ magnetic field that harbors energy for powerful explosions, and the active region is turning toward Earth. NOAA forecasters estimate at 65% chance of M-class flares and a 20% chance of X-flares during the next 24 hours. If there is a massive X class flare, we will have 18 to 36 hours to prepare for lights out for 12 to 36 months. Some preparation that you can take are HERE. More on EMPs HERE and HERE. Like many stars, the sun is prone to sudden outbursts. Erupting from the star’s surface, these events sometimes sling globs of charged particles and sun-stuff in Earth’s direction. If they’re powerful enough, these coronal mass ejections can produce geomagnetic storms that damage satellites and disrupt power grids. Though we’ve known about such eruptions for centuries (the most powerful on record occurred in 1859 and is known as the Carrington Event), scientists haven’t had a good handle on the mechanics behind the eruptions. Now, astrophysicist Tahar Amari of the Polytechnic School in Palaiseau, France and his colleagues have used a combination of solar observations and sophisticated calculations to trace the evolution and eruption of a coronal mass ejection. The team did this by studying four days of observations gathered by two space-based satellites and an Earth-based observatory in 2006. The observations preceded a coronal mass ejection. Then, the team combined those observations with a computer program that could trace the activity of individual magnetic elements near the sun’s surface. Amari and his colleagues found that pre-existing, twisted magnetic filaments simmering near the sun’s surface suddenly ballooned outward from an area of magnetic instability, producing kinetic energy that catapulted matter into space. 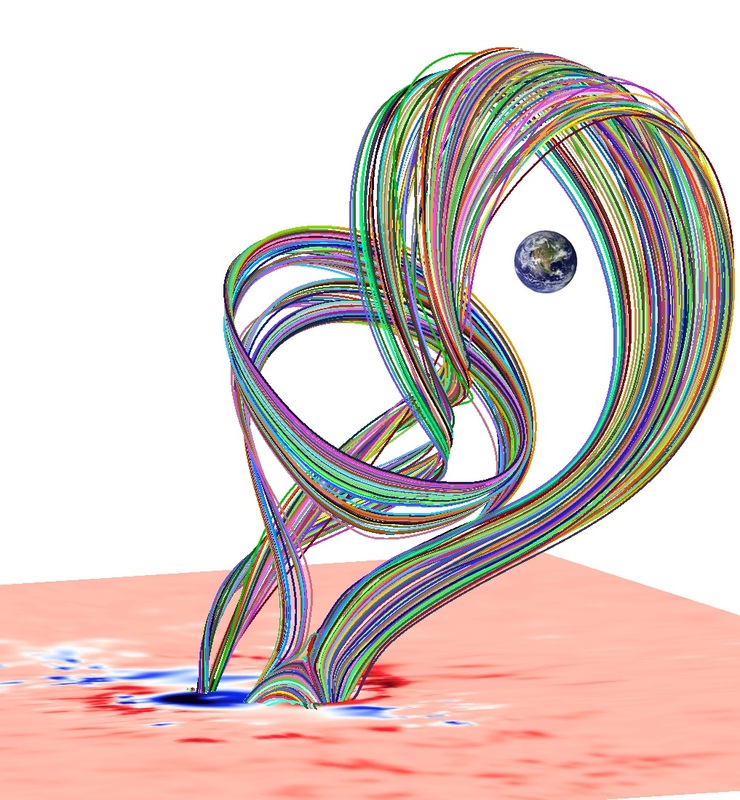 The modeling helps resolve an ongoing debate about whether eruptions arise from magnetic ropes that are already on the sun’s surface, or whether those ropes are produced during the events. The research, which the team published this week in Nature and is featured on the journal’s cover, resulted in several spectacular figures illustrating the formation of these solar slingshots. Flip through the gallery above to see some of these. This entry was posted in Analysis, Solar. Bookmark the permalink. 10/24/14: CHANCE OF FLARES: Giant sunspot AR2192 has a ‘beta-gamma-delta’ magnetic field that harbors energy for strong explosions. NOAA forecasters estimate an 85% chance of M-class flares and a 45% chance of X-flares on Oct. 24th. If an explosion does occur, it will be geoeffective because the sunspot is directly facing Earth. Solar activity associated with Space Weather can be divided into four main components: solar flares, coronal mass ejections, high-speed solar wind, and solar energetic particles. Solar flares impact Earth only when they occur on the side of the sun facing Earth. Because flares are made of photons, they travel out directly from the flare site, so if we can see the flare, we can be impacted by it. Coronal mass ejections, also called CMEs, are large clouds of plasma and magnetic field that erupt from the sun. These clouds can erupt in any direction, and then continue on in that direction, plowing right through the solar wind. Only when the cloud is aimed at Earth will the CME hit Earth and therefore cause impacts. High-speed solar wind streams come from areas on the sun known as coronal holes. These holes can form anywhere on the sun and usually, only when they are closer to the solar equator, do the winds they produce impact Earth. Solar energetic particles are high-energy charged particles, primarily thought to be released by shocks formed at the front of coronal mass ejections and solar flares. When a CME cloud plows through the solar wind, high velocity solar energetic particles can be produced and because they are charged, they must follow the magnetic field lines that pervade the space between the Sun and the Earth. Therefore, only the charged particles that follow magnetic field lines that intersect the Earth will result in impacts. Russ, since the sunspot is below the earth-apparent solar equator, would we not get a glancing impact as the main mass ejection roars past us? 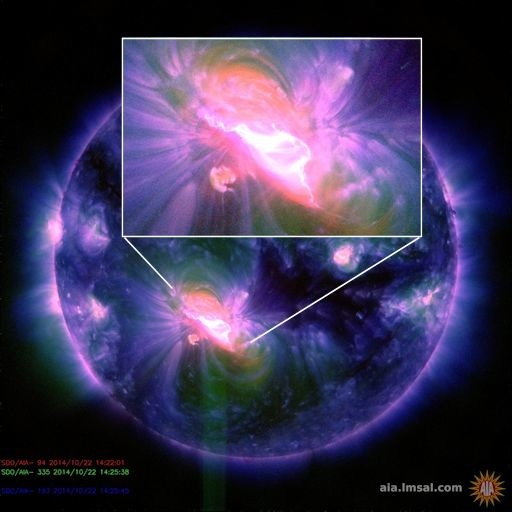 I posit this on the understanding that such ejections occur perpendicular/normal to the surface at ejecting sunspot. So the only ones aimed squarely at us would originate from some small region in the center of the sun’s disk as seen from earth. If that’s not the case, then non-normal ejections could occur in any (random) direction within a presumed cone with its axis perpendicular to the surface, and its apex at the sunspot. In that case it would be very difficult to predict which direction such an ejection would occur from an off-center sunspot that is at the origin of a chaotic mess of a churning magnetic field. Do you know what the real story is about such coronal mass ejections?